We have now entered winter in Seattle *cue rain clouds until April* – and while some days you may luck out with a clear and crisp sunny winter day, what are your options when the rain won’t let up and you have an outdoor photoshoot you just cannot re-schedule? Here’s my favorite tips and tricks for rainy day photography in Seattle – or places to go for part of your outdoor photoshoot when the wet stuff just won’t stop falling from the skies. If you are a plant and nature lover, the Volunteer Park Conservatory is the perfect rainy day respite for visiting. 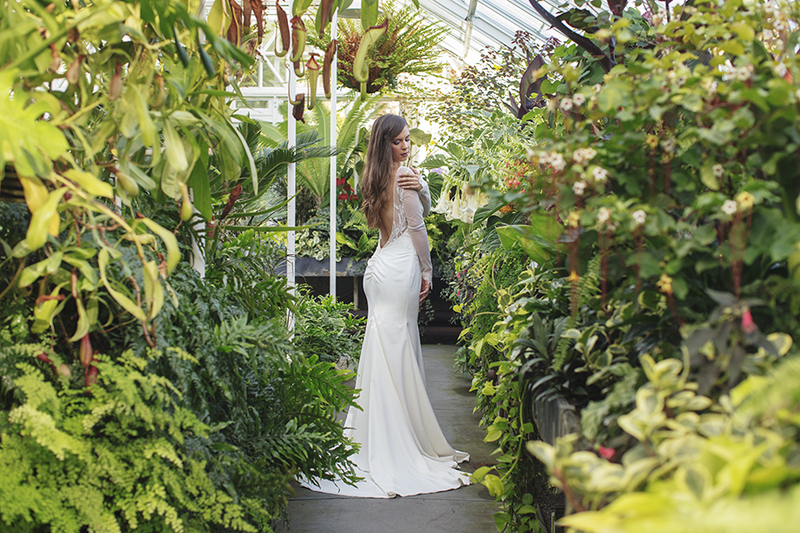 The warm lush tropical house and the hot and dry cactus house will transport you away from the Seattle gloom. Bear in mind photography here is at your own risk (meaning it is not allowed and you will be asked to leave if seen carrying a camera in). A City of Seattle Film permit is required, and are only given after hours. Obtaining a permit and doing a photoshoot inside are totally worth it, however, there are plenty of beautiful big trees around the park that you can hide under and seek shelter. Many years ago I did an entire fashion editorial under one of the big trees and we stayed perfectly dry in a torrential October downpour. On the south end? The WW Seymour Conservatory seems to allow photography (for now), however is much much smaller than the Volunteer Park Conservatory. While I have never personally done a photoshoot at the Seattle Public Library, I have seen many fun images from this space. There is a ton of great architecture (i.e. leading lines) and fun colorful spaces to play with. Lots of blue, red, and green. There is a lot of great outdoor space to cover at the Seattle Center. Perfect for urban styled photography as there is a lot of cement buildings, as well as fun architecture and leading lines. Look for all the covered areas – there is a covered walk-way near the fountain at the center, and a large building on the corner of Warren and Republican near the Vera Project. Down in SoDo there are two great locations, King Street Station and Union Station. They are two separate buildings, but just a block away from each other. King Street Station has all the white inside, with the upper balcony overlooking the rest of the train station. Union Station is one giant large hall, known for it’s green tiles. It took me months to track down the differences and that these are unique buildings – as many people mis-tag these on Instagram. While photography seemed okay there, it is very quiet, and may seem awkward when taking photos, however no one asked us to leave the day I was there! Just be quiet and mindful of people using the station and security guards. Pro Tip – double check hours of operation, as Union Station is closed some days of the week. Parking lots can be your best friend! Simple grey backgrounds and beautiful even light streaming in through the opening. Our favorite large parking lots (with large openings to the outside) are up at Northgate mall, and the infamous 3rd Ave “Bed, Bath and Beyond” lot. *Hint* It’s the one with the view of Moore Theatre behind. For the price of parking there, you will have access to the top, just drive all the way up! We’ve been asked to leave before, but if you have paid for parking, it seems okay to take a few photos there. Please be respectful to patrons and security guards. Thank you! I’ve always loved the University of Washington as a great rainy day option because the campus is so large, and there are so many options for covered areas. Check out the front of Kane Hall in Red Square – the cement columns create a lot of leading lines, shadows and mystery. In The Quad (right next to Red Square) are all the cherry trees (which provide cover in bad weather). This area is beautiful during Spring when the blossoms are in bloom (but you will also be fighting massive crowds – and will have to be creative to ensure people aren’t in the background of your photos). We recommend going on the weekend when class is out of session to deal with less people on campus. Luckily Seattle has a plethora of amazing coffee shops – and most likely multiple options in your area. I’ve always had great luck with photography inside coffee shops. I recommend asking a manager in advance – or if you are showing up in a pinch because it started raining outside – definitely buy something first, ask permission, and then be as uber respectful of paying customers. Some great ideas to get you started – General Porpoise on Capitol Hill or Slate Coffee in the University District. In between 11th and 12th Ave on Capitol Hill sits Chophouse Row – home to about a dozen rad local businesses. The interior courtyard is where the magic is at, and parts of it are covered. 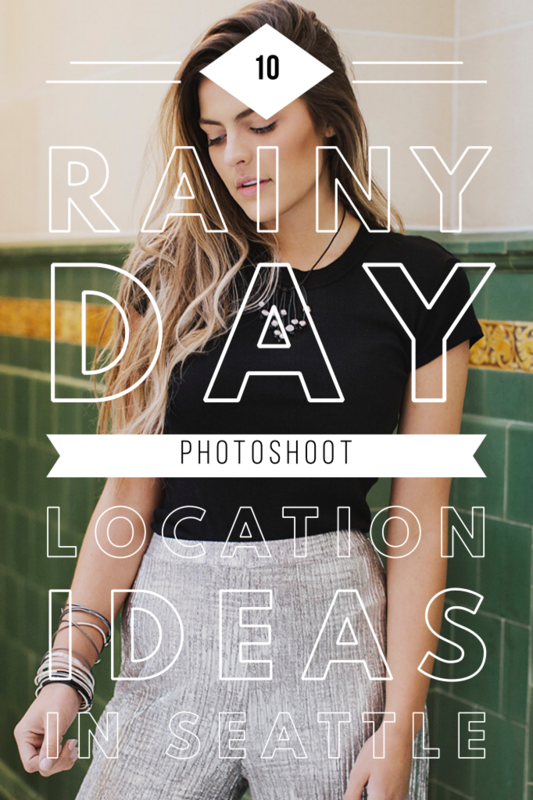 Grab a few photos here, then pop into your favorite coffee shop to wrap up your rainy-day photoshoot! Search for more places on Peerspace – which is essentially like AirBnb for studio and production rentals! Ideal for: Portraits, Fashion, Headshots, Couples, Family, and everything in between! Have an additional question about our list – or a tip to add? Please send me an email and we’ll update our post!